Regular visitors to this website know that on many occasions we discuss originality. If you examine most movies, you will find that, on some level, they are a copy of something else and discovering a film which has anything truly new to say is rare. It can be even more difficult to find a filmmaker who constantly brings innovative ideas to the screen. That is not the case with David Cronenberg. After making some experimental films, Cronenberg burst (literally) onto the scene in 1975 with Shivers (AKA They Came from Within). From there, he released a string of bizarre films, all of which dealt with bad things happening to the human body. 1979's The Brood is amongst the best of this period. The Brood introduces us to the Carveth family, who is going through a rough time. Nola Carveth (Samantha Eggar) is locked away at The Raglan Institute, under the care of Dr. Hal Raglan (Oliver Reed). Her husband, Frank (Art Hindle), has been unable to see or speak to Nola, even when he drops off their daughter, Candice (Cindy Hinds) for visits. When Franks notices bruises on Candice's back, he begins to suspect that something is wrong at the Institute and begins to investigate Raglan. The doctor has created a new form of psychotherapy called "Psychoplasmics", which causes the patient to suffer from physical symptoms as well as mental ones. When people around Frank begin to die horrible deaths, he becomes convinced that something truly deadly is hiding behind the facility's tranquil facade. In some ways, The Brood shows a filmmaker who is still learning his craft. When seen today, the pacing is excruciatingly slow at times and there are some trademark 1970s unnecessary establishing shots and scenes with characters walking or driving. (As if we can't comprehend how they got from one place to another.) The story feels incomplete in sections and we are left to guess as to why Nola went to The Raglan Institute in the first place (I mean, she's clearly crazy, but some details would have been nice). The acting is very stiff at times and even after seeing the movie on multiple occasions, I still can't decide if Cindy Hinds is playing someone who is traumatized or is simply incapable of expressing emotions. And this isn't a criticism as far as I'm concerned, but I can see how some people won't like the sterile feeling which Cronenberg gives The Brood, both in the environments and with the interactions between characters. However, throw all of that nitpicking aside, as the story in The Brood is so crazy (no pun intended) that it overrides all of the movie's problems. I won't give the big plot twist away, but Cronenberg has taken a very simple idea and made a very clever movie from it. We've all heard that stress can lead to health issues in the human body. Cronenberg adopts this notion and runs rampant with it, creating a film which features some true grotesqueries. He mixes these ideas with his personal life, as Cronenberg has admitted that he was going through a bitter divorce at the time, which clearly affected his view towards relationships. He also takes a cue from Nicolas Roeg's 1973 film Don't Look Now, as we must wonder who that small person is who is lurking through the film. The result is a movie which begins as a bit odd, but appears to be a simple drama about a man who is trying to keep his family together. But, the second half reveals itself to be a truly wild ride, as the string of murders leads to a tense climax. I don't know if Cronenberg is necessarily known for his mastery of suspense, but the editing during the finale is superb and will have some viewers on the edge of their seats. That is, if they aren't in the bathroom vomiting over the reveal of exactly what is going on in the Institute. I can see how some modern audiences will find The Brood cold and boring, but even the most jaded viewer will have to admit that the ending shows that Cronenberg is a truly creative, and possibly slightly demented, person who has created a tale which will stick with you. The Brood certainly isn't Cronenberg's flashiest movie, but due to it's original nature, it's my favorite of his. 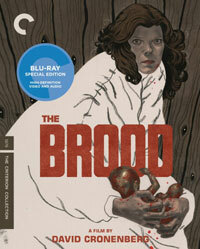 The Brood will make your wary of snowsuits on Blu-ray Disc courtesy of The Criterion Collection. The film has been letterboxed at 1.85:1 and the Disc contains an AVC 1080p HD transfer which runs at an average of 31 Mbps. The image is very sharp and clear, showing only a fine sheen of grain in some shots and no overt defects from the source materials. There have been plenty of times in the past where I was not impressed with a transfer from Criterion, but this one looks good. The colors are notably good and look very realistic. The image is never overly dark or bright. The crispness of the daytime shots lends a nice amount of depth to the image. The Disc carries an LPCM 1.0 audio track which runs at 48 kHz and a constant 2.3 Mbps. The track provides clear dialogue and sound effects. While we don't get any truly dynamic audio effects here, the track shows no hissing or popping, nor is the dialogue muffled. Also, the music and sound effects never tread on the dialogue. The Brood Blu-ray Disc contains an assortment of extra features. "Birth Pains" (31 minutes) is a modern documentary which examines the work of David Cronenberg. While Cronenberg himself doesn't appear here, we get comments form the likes of Samantha Eggar, Director of Photography Mark Irwin, Producer Pierre David, and make-up artists Rick Baker and Joe Blasco (neither of which worked on The Brood). The piece does eventually settle in and focus on The Brood, including the casting and production. "Meet the Carveths" (20 minutes) is an interview with Art Hindle and Cindy Hinds from 2013 conducted by Chris Alexander. We get an episode of The Merv Griffin Show (21 minutes) from 1980 which features an interview with Oliver Reed. On the show that day are also Orson Welles and Charo. Talk shows used to be very conversational. 1970's "Crimes of the Future" (63 minutes) is one of Cronenberg's early experimental films. It's a forerunner of his taste for odd architecture and bizarre science. "Cronenberg: The Early Years" (13 minutes) is an interview with the director (again with Chris Alexander) where he talks about his first films. The final extra is a 30-second RADIO SPOT for The Brood.